Made to be totally child-safe, the Kids Animal Stool comprises a sturdy wood frame with solid rubberwood legs. Thick sponge padding is found in the seat and head, and the entire assembly is wrapped in durable polyester fabric for longlasting use. 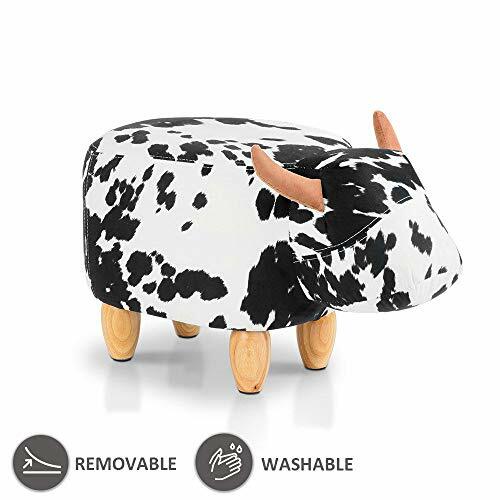 With a weight capacity of up to 300 lbs, the Kids Animal Stool is easy to maintain and promises to deliver many years of great fun for your child. ★★★ Removable Cover for Easy Clean: The cover is removable and it is convenient for you to remove it for a wash.
★ More wear-resistant, not easy to dirty, can also be dismantled and cleaned. ★ It can be placed in the bedroom, the living room, convenient to carry. ★ It is the best spare little stool for the sofa to give you a comfortable and happy home.